Os Correios de Macau, Macao Post and ORBIS Macau joined hands to issue the semi-postal stamps with the theme of “ORBIS – 30 Years of Saving Sight” on 9th October, 2012, aiming to raise funds to support the programs of ORBIS as well as to arouse public awareness on the blindness problem and to provide practical support to ORBIS. The selling period of this issue had been finished on 8th April, 2013, the funds raised amount to a total of 265,022.00 patacas. The Donation Presentation Ceremony is held at the celebration activities of “World Post Day” at the Museum of Communications on 9th October, 2013. 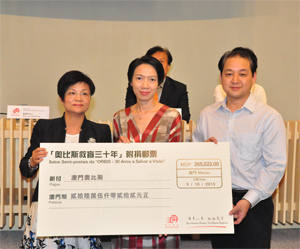 Ms. Derby Lau, the Director of Macao Post, presents the donation to Ms. Vivian Lo, the Director of Development of ORBIS Macau. The fund raised from the semi-postal stamps will be dedicated for the children’s sight-saving program.